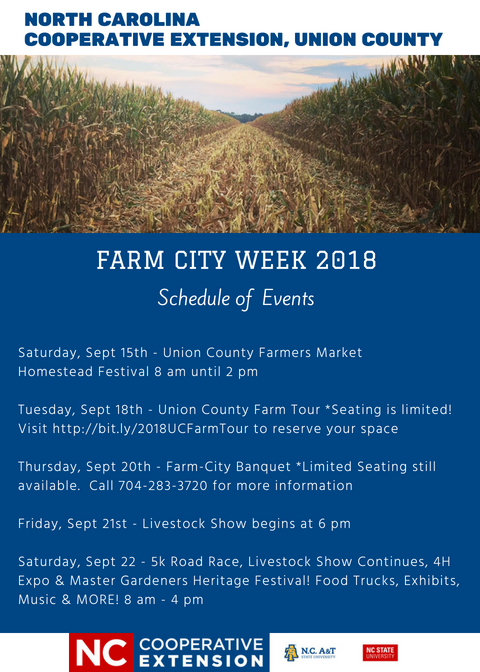 Our Farm-City Week Celebration for 2018 Schedule of Events is here!! Join us for a week-long celebration of Agriculture in Union County starting on Saturday, September 15 at the Union County Farmers Market located at 805 Skyway Drive in Monroe. The Farmers Market will be hosting a Homestead Festival featuring demonstrations of farm skills prior to 1930! There will be grist mills, apple presses, spinning demonstrations, soapmaking and more! The hours are from 8 a.m. until 2 p.m. and the event is FREE! Tuesday, September 18, N.C. Cooperative Extension of Union County is hosting its annual Farm Tour. Your N.C. Cooperative Extension Agents have planned a tour that highlights the various agricultural operations here in Union County. Please register online. Seating is EXTREMELY Limited at this point! You can also call Crystal Starkes at 704-283-3735 to check on seating availability. Thursday, September 20 is the Annual Farm-City Banquet. This year’s theme is “The History of the Harvest – Celebrating 175 years of Agriculture in Union County.” The evening brings together various businesses throughout the county to celebrate the role of agriculture in our community. There will be historical displays, live entertainment provided by Southern Express, dinner, and an awards ceremony. There are still a few table sponsorships left. Please contact Nancie Mandeville at 704-283-3720 if you are interested. Tables seat 8 people and are priced at $160 for a Gold level sponsorship and $120 for a Silver level sponsorship. Friday, September 21 starts the Livestock Show at 6 p.m.! Sheep are up first with the show continuing into Saturday, September 22 at 9 a.m.
Saturday, September 22 has so much to offer! The Wild Turkey 5K Trail Run begins at 8 a.m. Register online. Check-ins begin at 7 a.m.
At 9 a.m. the Livestock show resumes, as well as the 4-H Expo which will display exhibits and projects from Union County’s 4-H participants. Learn about 4-H and all that it has to offer, from traditional agricultural related clubs to shooting clubs, homeschooling clubs, robotics, STEM, Leadership Development, and so much more! Also on our same campus, you’ll enjoy the Extension Master Gardener℠ volunteers of Union County’s Heritage Festival. Enjoy a day filled with fun for the entire family including cooking demonstrations, live music, food trucks, presentations by NC Falconry Guild, Joy Goforth – NCDA, Matthew Sganga – Stone Table, Mary Roberts – Windcrest Organics, Chef Elaine Templeton & Chef Joel Morris along with the students of the UCPS Culinary Arts Academy, Lisa Tompkins – Carolina Heritage Nursery, and Gladys McCain Kerr discussing local history. Kids activities include face painting by Mallory Tartaglia, a pedal cart track from NC National Guard, Atomz Labs, Science Outreach from Wingate University, Union County Parks & Recreation, and more! You are sure to find something to enjoy during this year’s Farm City Week! We hope to see you there! All events with the exception of the Union County Farmers Market Homestead Festival (805 Skyway Drive, Monroe) take place at the Union County Agricultural Center located at 3230 Presson Rd, Monroe, NC 28112.